The Eighth Judicial District Commission on Judicial Performance recommends by a vote of 10-0 that Judge Terence A. Gilmore BE RETAINED. Judge Gilmore graduated from George Washington University with a B.A. degree in 1970. He received his law degree from the University of Denver in 1972. He received the Conrad Ball Award for Significant Contribution to Improving the Quality of Justice in Larimer County and has served as chairman of the Criminal Justice Advisory Committee. Judge Gilmore also has served on the Board of Directors of Pathways Hospice. 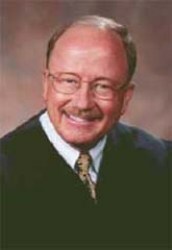 Judge Gilmore was appointed to the District Court of the Eighth Judicial District in 2001. Prior to his appointment, Judge Gilmore served as Chief Deputy District Attorney in the Eighth Judicial District. He was in the District Attorney’s Office for 27 years. Judge Gilmore was in the private practice of law for two years. The Commission reviewed evaluation surveys; the judge’s self-evaluation; written opinions authored by him; and individually submitted letters; performed courtroom observations; convened a public hearing; interviewed representatives of the District Attorney, County Attorney and Probation Offices; and conducted an interview with Judge Gilmore. Attorneys who responded to the survey questionnaire rated Judge Gilmore above average for all district judges in every category: application and knowledge of law, demeanor, communications, diligence and case management. Non-attorneys who responded to the survey questionnaire also rated him above average in all categories. Both attorneys and non-attorneys found Judge Gilmore to be a hard-working, courteous jurist whose priority was fairness to all parties. He was often described as polite, patient, thorough and professional. He also was referred to as knowledgeable and impartial. The Commission reviewed a number of opinions written by Judge Gilmore and found them to be well written with his conclusions grounded on the facts of the case and applicable law. The Commission also found that although his decisions were based upon the law, they were tempered with compassion. The Commission is aware of the community’s concern surrounding the public censure of Judge Gilmore by the Presiding Disciplinary Judge in September, 2008, regarding his role as a prosecuting attorney in the Masters case prior to his appointment to the bench in 2001. The Commission believes this concern is relevant. This concern was discussed by the Commission and addressed directly with the judge. The Commission believes that, because Judge Gilmore’s judicial performance is outstanding, the community is well served by his presence on the bench.